Tweezers or tongs (or even kiddie chopsticks like the ones I got from Sur La Table) are great for building muscles required for handwriting. Tweezers are something that almost everyone has at home which makes it even better, almost like getting a free tool! They also pair quite nicely with kit item #3, puff balls. Click here for a past post on tweezers. 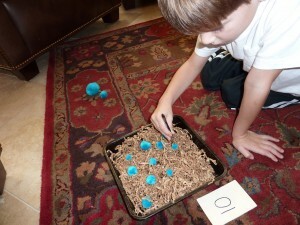 My Obstacle Course Station Activity: Help the baby spiders get back to their mom! 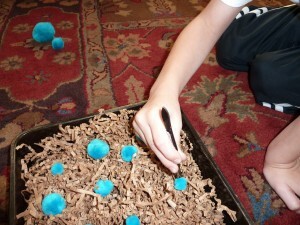 This was a really easy station to put together using tweezers, some brown shredded paper and colored puff balls. That is it! You don’t even need the shredded paper, you could have them scattered about on a cookie sheet or foil tray in salt or sand and pretend they are lost in the snow or desert. 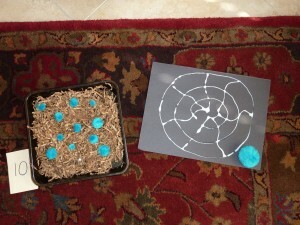 My Obstacle Course Station Activity: Help the baby spiders get back to their web. The photo above shows how the station looked when I set it up but the glue I had used to make the web was not yet dry and I didn’t want the babies to get glued onto the paper. I just took it away and as you can see from the photos below, Andrew didn’t care one bit! Very serious about this job! Squeezing to pick up one of the "babies." 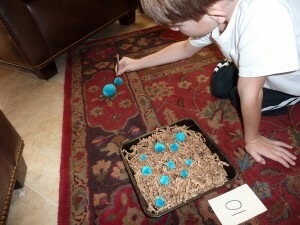 Can you see how using this tool helps to build those handwriting muscles? If you want to see other posts showing how I have used tweezers, just click here for the tweezers search results from my website.